At Charities Review Council, our focus is on building authentic relationships between donors and nonprofits using our Accountability Standards®, by providing the spaces, places, and tools to do just that. We know that our community is stronger when donors and nonprofits deliver the greater good in partnership. In fact, nothing excites us more than when we see a nonprofit working hand in hand with their donors to create even greater impact in our community. At Annual Forum 2015, we’ll have the opportunity to highlight those partnerships with the all NEW Better Together Award! We want to highlight YOU! The Better Together Award will recognize an engaged, creative, and collaborative donor-nonprofit relationship that is changing the community for the better. As our Executive Director, Kris Kewitsch, says, “Last year’s Annual Forum generated palpable energy and excitement, highlighting unusual partnerships between donors and nonprofits.” Kris and the Charities Review Council team are excited to continue the #DisruptMN conversation, which recognizes the value of coming together in new and creative ways to create even greater outcomes. To illustrate what a creative, collaborative donor-nonprofit relationship could look like, we called in our reinforcements; engaged Council donors and supporters, Lorraine Hart, Lee Hickerson, and Nausheena Hussain, who in partnership, help us achieve our mission of mobilizing informed donors and accountable nonprofits for the greater good. Apply today for the NEW Better Together Award for a chance to win $1,000 for your nonprofit organization. Donors and/or nonprofits are encouraged to apply. Donors applying should work together with the partner nonprofit to complete the application requirements. 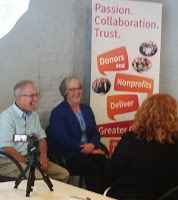 We look forward to hearing from YOU about your collaborative and creative donor-nonprofit relationship!